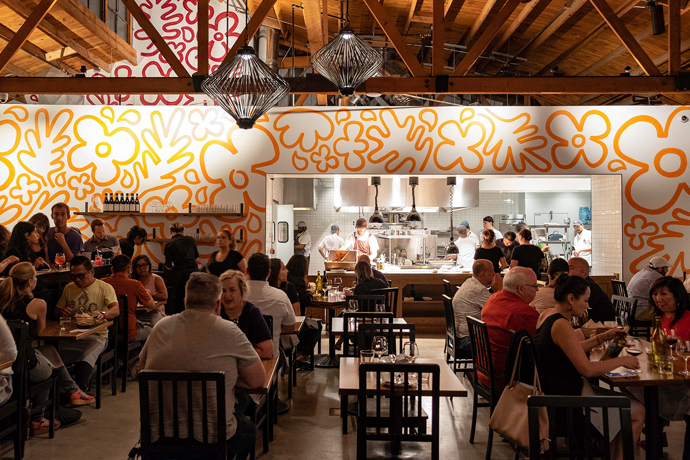 Sometimes you actually should mess with a good thing.Or so goes the theory at your favorite low-key Italian hideaway on La Brea, Cube, which has just unveiled some major changes. At lunch, you might now try a Red Wine-Poached Pear Salad with Pomegranate Seeds, Hazelnuts, Endive, Wild Baby Arugula and 300-Day Gorgonzola, and dinner could bring Handmade Chestnut Ravioli with Mascarpone and Sage Sauce. You'll want to start, though, by selecting from the evolving assortment of burrata and salumi flown in from Italy weekly that won't be available anywhere else in the country. And to finish, the new pastry chef might serve you, say, Panettone Bread Pudding with Homemade Dulce de Leche Ice Cream and Orange Caramel. But not everything has changed. You still have to bring your own wine, and you'll recognize the same deep crimson walls, shelves of market goods and waitresses that deftly field even the most obscure cheese question—unlesss he's momentarily flustered by Jake Gyllenhaal at the next table over. Or by your equally devastating charm.